I stayed perfectly still after they chased me into the air vent. I hadn’t heard anything for several minutes. Surely they’d left by now. Crawling out of my hiding spot, I found myself face to face with one of my pursuers. He hadn’t moved. He started shouting, but he remained locked in place, unable to move at all. Alien: Isolation had broken again. This piece originally appeared 6/29/15. Video game artificial intelligence (AI) is something most of us don’t notice until it breaks. It’s always there, influencing our gameplay experience, affecting how we feel about every moment in a game, but it’s also one of the most overlooked elements of video gaming. AI is the spice that takes a video game from bland to cool—it’s the thing that immerses us in a game world the way nothing else can. AI means a lot of different things to a lot of different people, especially in video games. The term can refer to the programming processes that drives a game’s characters, individual entities within the game, or even, in some cases, opposing players you never see, like the enemy players in a real-time strategy game. Back to Alien: Isolation. It’s a great game, occasional glitches aside. Never before have I played a movie game that let me felt like I was actually inside a movie. 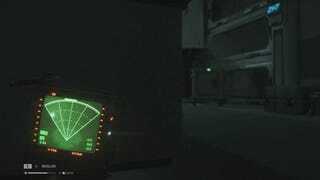 Alien: Isolation makes me feel like I’m one of the characters in an actual Alien film, like I’m there. Every Alien film establishes a clear goal: kill or get rid of the alien. Many individual moments throughout the films lend themselves to interesting gameplay, whether it’s Dallas climbing through the air vents with a flamethrower or Ripley in a mech-loader, punching out the queen. These films, like video games, are very encounter-driven. The stories in the Alien universe translate to game mechanics extremely well. The alien itself is a complex creature, which means a lot of gameplay possibilities. It hides in shadows, encouraging attention to level design. It can crawl in air vents, leading to surprise attacks on the players. It hates fire, so we can use flamethrowers against it. At the same time, these complexities are somewhat rigidly defined. We know how the alien’s life-cycle works. We know that it bleeds acid blood. We know it takes on the characteristics of its host. In other words, the Alien films have set up a distinctly compelling sandbox for developers to play in. 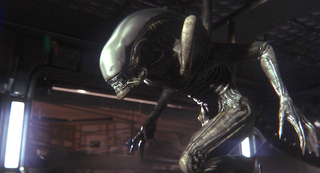 Alien: Isolation depends on the strength of its AI to be an enjoyable experience. The alien must act in a way that helps the player feel like they’re in an Alien movie. That is its job. Every decision you make in Isolation comes back to the alien. Do you hide? Use precious flamethrower fuel? How long do you wait for it to leave? You are living the Alien experience with an “actual” alien that will act and think like an alien. That’s awesome! It’s also terrifying. Mostly awesome, though! I’ve talked with plenty of people over the years about “good game AI.” I’ve had developers and critics alike tell me that good AI is impossible, because, to them, good AI is what is technically known as “strong AI,” or AI that is essentially as smart, if not smarter than a human. Personally, I don’t think that’s good game AI. Good game AI is that which makes a game enjoyable to play. A strong AI would be more like another player, with the same goals a player has: it wants to win. Good game AI doesn’t want to win, it wants to make you earn your win. This is why the alien is not some realistic simulation of movie’s greatest monster, but an impression of it instead. In Isolation, the alien is almost always nearby. Sure, you can distract it for a while, or move from one room to the next, but it’s always going to end up close by anyways. The alien is often believable, until it decides to inexplicably hang around in one room while you hold your breath, hoping it will leave so you can crawl out of the locker. The alien appears to have an approximate knowledge of your location at all times, popping up wherever you are, which keeps things tense and uncertain. It doesn’t outright notice you (except for the times it glitches and does) unless you fail the stealth game aspect of gameplay. This is great for maintaining the horror movie tension, but sometimes the game stretches a bit too much and it starts to feel fake. Several times, I’ve watched the alien leave the room on my motion detector, disappear, and reappear behind me almost instantly. Occasionally, the game’s so focused on crafting tension that it forgets about something far more important: immersion. The funny thing about the word “immersion” is that, through marketing overuse, it’s essentially lost all meaning. Now, any game that holds your attention is “immersive.” While it’s true that “immersive” is more or less synonymous with “engrossing,” it has another, more specific connotation relating to the idea of being submerged. When you are immersed in the ocean, you exist inside the ocean. The 1990s gave rise to the concept of the“Immersive Sim.” The idea was that players could exist within a game’s world and treat it as if it were a real space. Some of the most well-known 90s immersive sims include games like System Shock and Thief: The Dark Project. Both of those games were developed by Looking Glass Studios, and both put an especially heavy focus on artificial intelligence. A game without great AI is like an empty movie set. A good set is nice to have, but a movie thrives on its characters. Great AI breathes life into a game’s characters and its world. It is the most important ingredient in replicating that immersive movie experience. For a good example of an immersive sim in action, let’s look at a level from Looking Glass’s 1998 classic Thief. The game takes place in a fantasy world, and you play as a thief named Garrett. One mission sends you down to the Bonehoard, a series of underground ruins. One particular area of the map features zombies. These aren’t your normal zombies, however; you can’t hack them to pieces. They’ll get back up shortly after you’ve killed them. The only way to truly be rid of them is to use holy water on your expensive water arrows—which are traditionally meant for putting out light sources, allowing you to hide better. I was playing the game recently and the zombies were proving particularly troublesome. When a zombie notices you, it roars, alerting other zombies who roar, alerting even more zombies. Being caught meant being swarmed by every zombie in the level. It was frustrating. I didn’t have enough arrows or holy water, either. So, I formulated a plan. I found a room occupied by two or three zombies. I quietly opened the door, then snuck to a balcony above it. I fired at the first zombie with a regular arrow. He roared. His friends roared. They began searching the room for me, not realizing I was hiding above them. Soon, more zombies began to arrive. When the room was finally packed, I began firing my holy water arrows. The splash of water from the arrows meant that I could kill multiple zombies with a single arrow. I made short work of them. That’s the concept of immersion in a nutshell. The game created a space. It created enemies who had a logical set of rules. It gave me water arrows, and, logically, they would splash, because that is what water does. I was able to treat the game-world as if it were real and MacGyver up a creative solution to deal with the zombies. When a game breaks immersion, it pulls you out of the experience. Good game AI, I think, works like Thief’s, rather than Isolation’s. Tension is important in an Alien game—it’s a crucial component—but immersion is the bedrock that it should be built on. If a game stops being believable, does it continue to be scary? Of course, for immersion to work, we have to buy in to the experience. Alien, the movie, only works if we let ourselves get absorbed in its reality. It doesn’t work if someone stands in front of the screen telling us that an alien didn’t really burst out of a man’s chest. 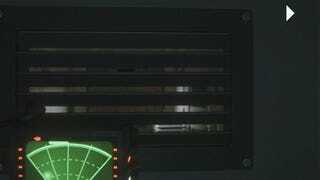 It’s a symbiotic relationship: Alien: Isolation, as an immersive game, must do what it can to present a “real” world to us, and we must treat it as if this is so. We have to be along for the ride. Because Alien: Isolation is a video game, it has to be interactive, which means it has to put a lot more work into feeling “real” than Alien ever did. For the experience to work, the game has to be immersive. The rules have to make sense and be consistent. If either you or the game breaks that relationship, the game stops being scary and the experience falls apart. When the people hunting for me stop moving, or when the alien teleports behind me, it breaks my immersion and pulls me out of the experience. It stops being scary, which is the whole point of an Alien game in the first place. We play Alien games because we want to live the Alien experience. When the AI breaks or cheats, the immersion is lost and the game falls apart. When the AI works, then we become Ripley, hiding in a locker, holding our breath, waiting for the monster to pass.